WHY? An architectural construction game is a really good tool to help kids to develop spatial sense and to improve their manipulation skills. It’s also less connected with the catalan tradition, so the game can be understood internationally in an easier way. WHAT? Nan Casteller is a toy brand that has created a really successful construction game based in Castellers, the human towers that we build in Catalonia. In order to grow to have an international expansion, the client asked us to design a house for Nan, the little human figure that acts as a piece of the towers, using Trigonos construction system as a starting point. The client asked us to make a gender free creative game, like the original Nan Casteller game already is, and this petition was really coherent with the values we think a game must have. HOW? We have created a modullar system that integrates a blackboard base, two sizes of sticks, the wooden cubes and fabrics that allow to build an infite number of different houses. 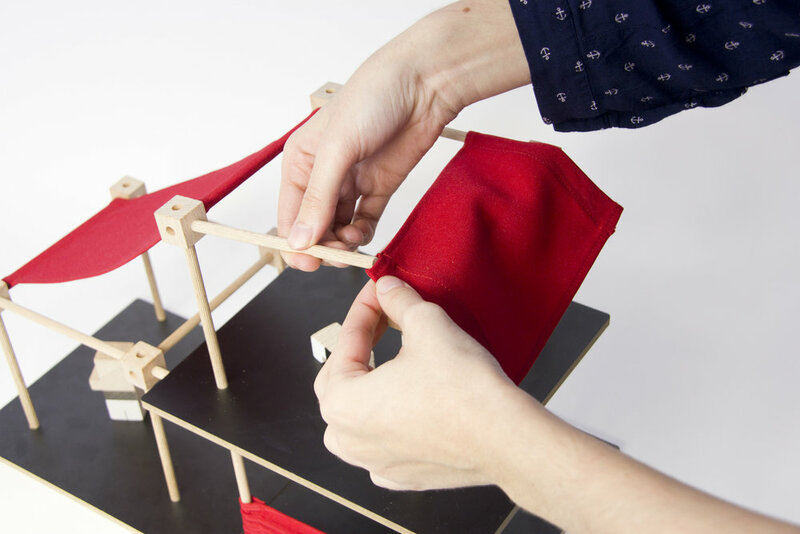 The basic kit can be complemented with others to create bigger constructions, so the game never ends thanks to its modullarity and flexibility. The system works as a 3d puzzle, challenging the skills of the kid to connect the different pieces between them. We decided that the connection of the pieces shouldn’t be automatic in every position, to create basic construction challenges that the kid needs to beat, like if they were little architects facing the design of a real house. It also enhances their creativity and problem resolution skills. The blackboard bases allow you to draw furniture, frames, carpets or the nature of the backyard of the house, so the game admits different levels. The production is made in a social work company, that gives job to intellectual dissabled workers, and its design has been developed working closely with their technicians to be as easy and efficient as possible. In Nutcreatives we have also developed the packaging, designing a box as flat as possible in cardboard, that can represent the shape of the roof of a house, and it’s the perfect place to save the pieces after playing to not to become waste. The fact that the main material, wood, is a renewable material and its social production makes Nan House a product with not only functional benefits as a game, but also environmental and social.